Foodhoe crashed and burned recently, this restored post was previously published, lost the comments too. So, yes you may have seen this already, sorry for the duplication/confusion, but I was busy making some enhancements to the site… bear with me, I’m still tweaking! 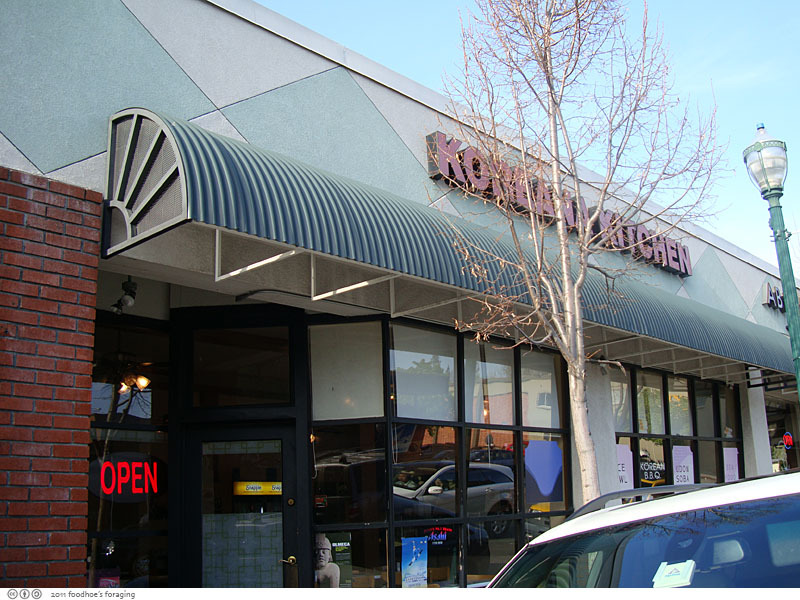 This is one of our favorite places in downtown Walnut Creek for a quick bite to eat. It’s a cozy, quick and casual spot tucked away on a side street. The menu presents a variety of Asian influenced rice and noodle dishes, all of which are served in bowls. One of the highlights of the menu is the tender grilled chicken that is offered as the protein in many of the dishes. They offer a quite few Korean dishes, which makes them the closest thing to a Korean restaurant in the Creek. If you ask, they will give you a bowl of garlicky housemade kimchi. 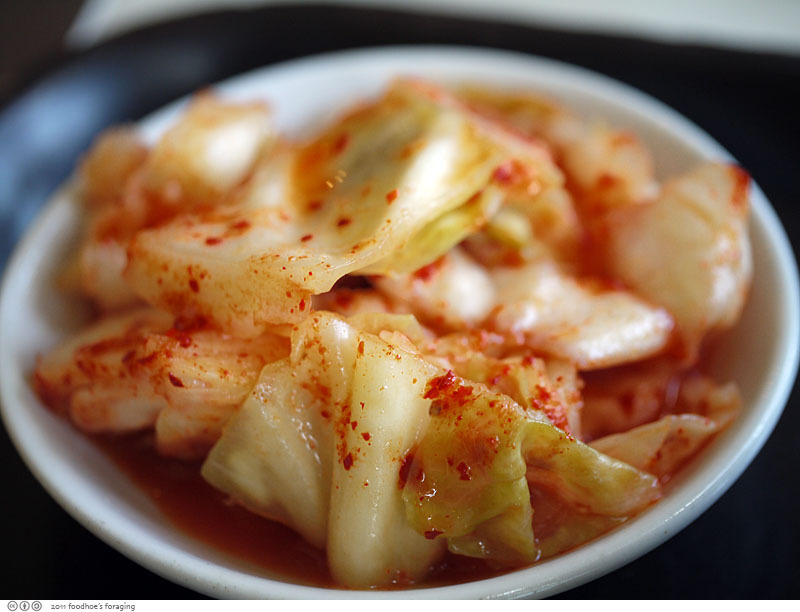 It’s fresh and crunchy, spicy but not incendiary and doesn’t have any fermented funkiness. This is the Chicken Vegetable Bowl ($7.95), which is basically a Bibimbap, full of fresh vegetables (julienned carrots, zucchini, spinach), marinated bean sprouts, topped a pile of their famous grilled chicken, covering a layer of savory vermicelli noodles (japchae) over rice. There are squeeze bottles of homemade gochujang, which is so good drizzled over almost everything. If you are unfamiliar with it, here is a very informative post on the fabulous One Fork One Spoon blog written by Grace Meng. 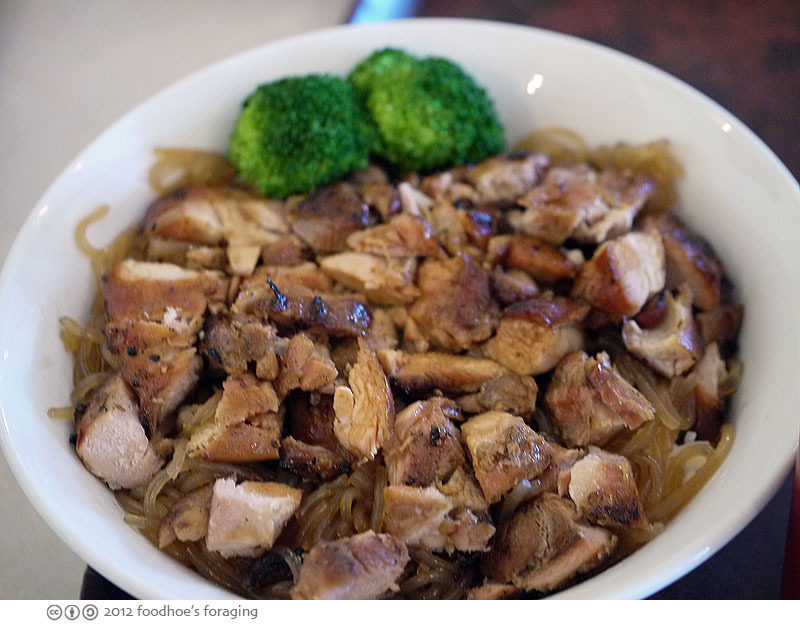 And if you don’t want all of those vegetables, you can order the Chicken Bowl ($7.50), which is a big pile of grilled chicken over rice and noodles. 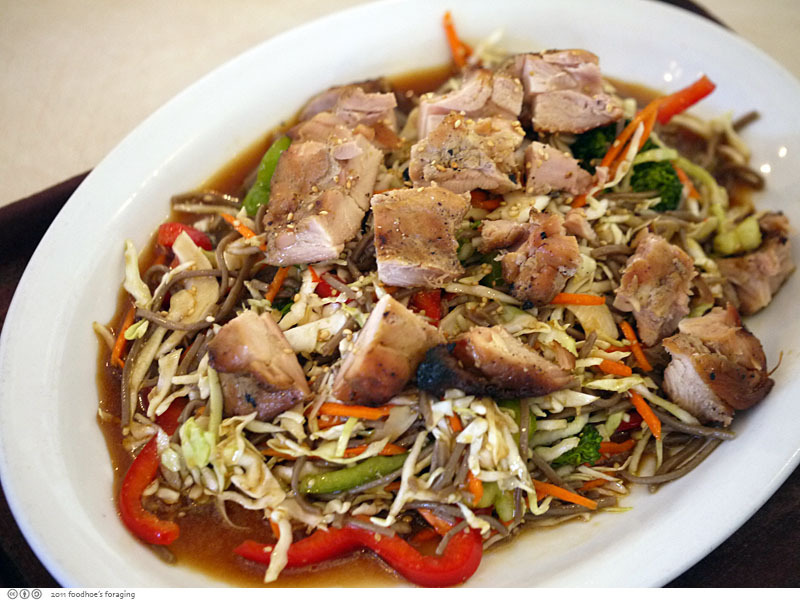 Diablo Magazine has the Hot Pork Bowl listed as #21 on their list of 101 best things to eat and drink in the East Bay. Hmmm, that list looks good, I’m tempted to try them all! 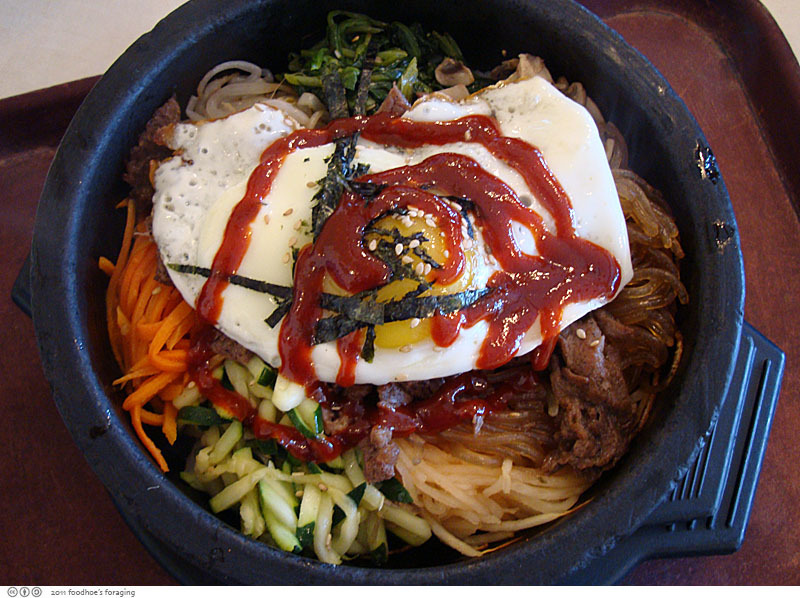 They serve a very good Dolsot Bibimbap ($9.95), served in a sizzling hot stone bowl that is heated so that the rice sizzles and cooks to form a crisp crust. 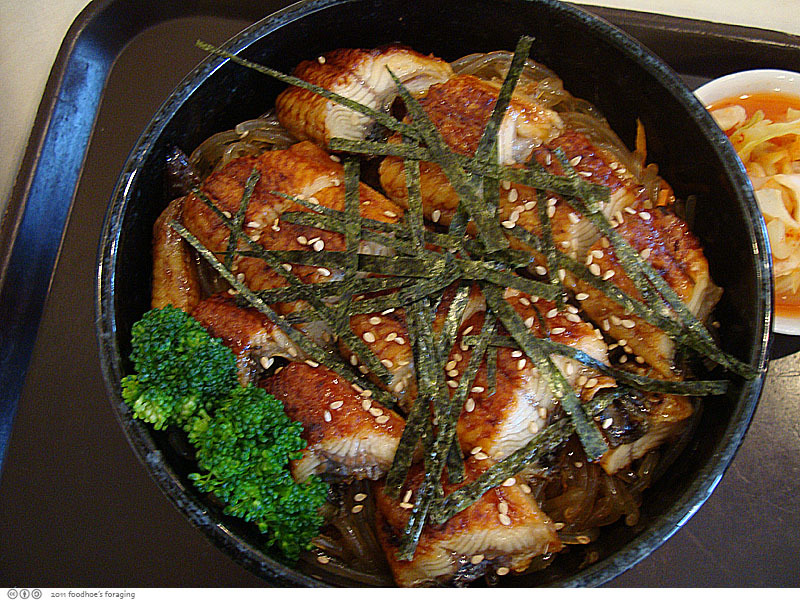 The Unagi Bowl ($9.95) is a generous portion of thick slices of grilled eel laid over a layer of japchae (korean vermicelli noodles) and steamed white rice. It is topped with strands of toasted seaweed and sesame seeds, which add a rich aroma and flavor. The eel is coated with a sticky sweet soy barbecue sauce and develops crispy caramelization on the edges. 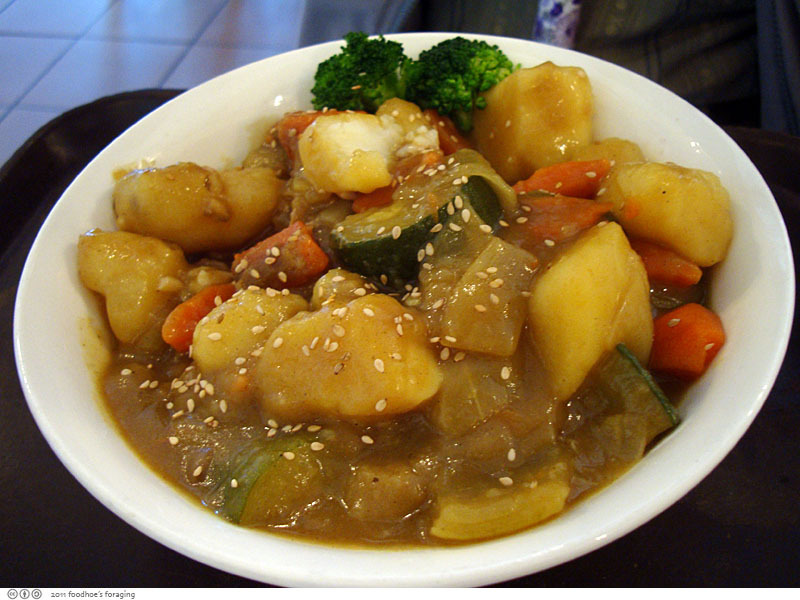 The Japanese style Curry Rice ($7.95) is a generous mountain of steamed potatoes, zucchini, carrots and broccoli made with beef, chicken or pork in a thick savory curry stew that is served over steamed rice. Japanese curry is not spicy hot in the least, it reminds me of a basic brown stew with the addition of curry, and is surprisingly addictive. 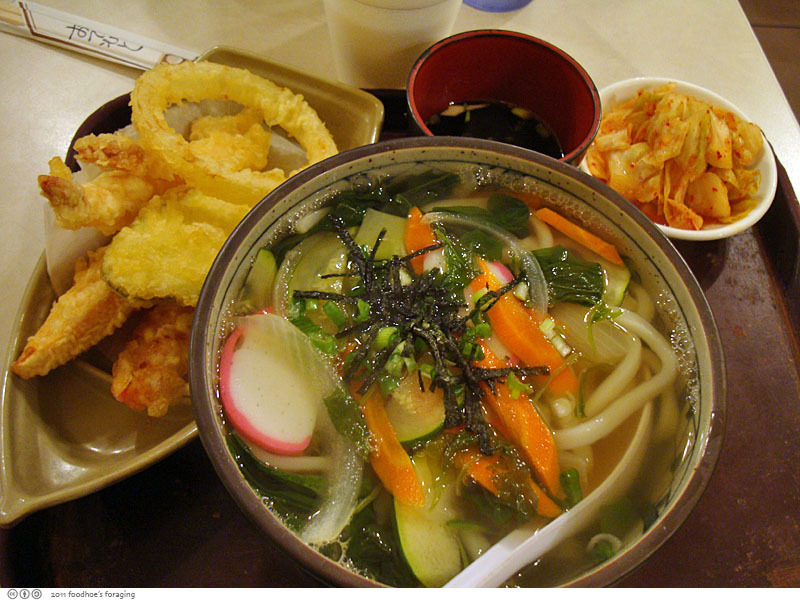 My favorite of the noodle soups is the Tempura Udon ($8.95) which is served in a savory dashi broth that is flavorful and satisfying. The tempura is served in a separate plate with a bowl of dipping sauce, but I like to dip the tempura into the bowl of noodles which softens the batter and adds richness to the broth. They offer a variety of noodles, udon, soba, saimin and something that might be ramen, all of which tend to be on the bland side but are good when it’s cold out. 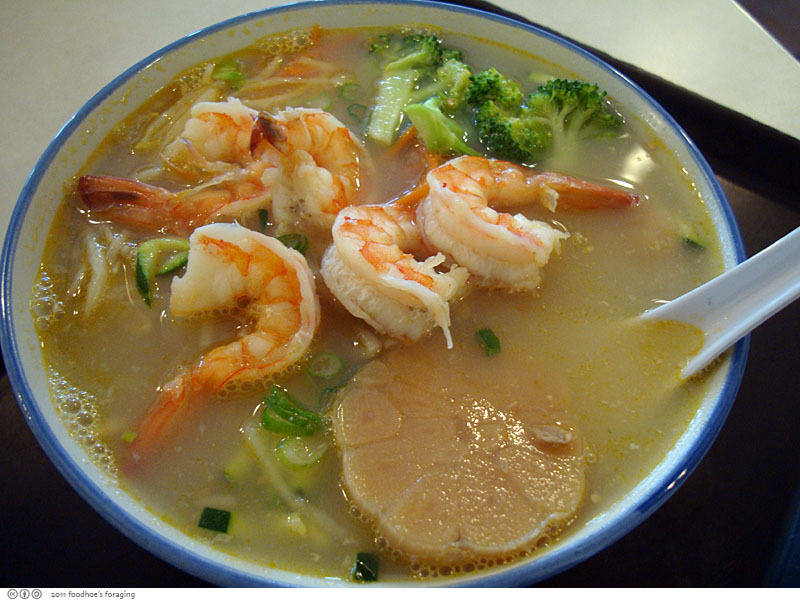 The Garlic Shrimp Noodle Soup ($7.50) has an entire head of garlic floating in the thin broth. 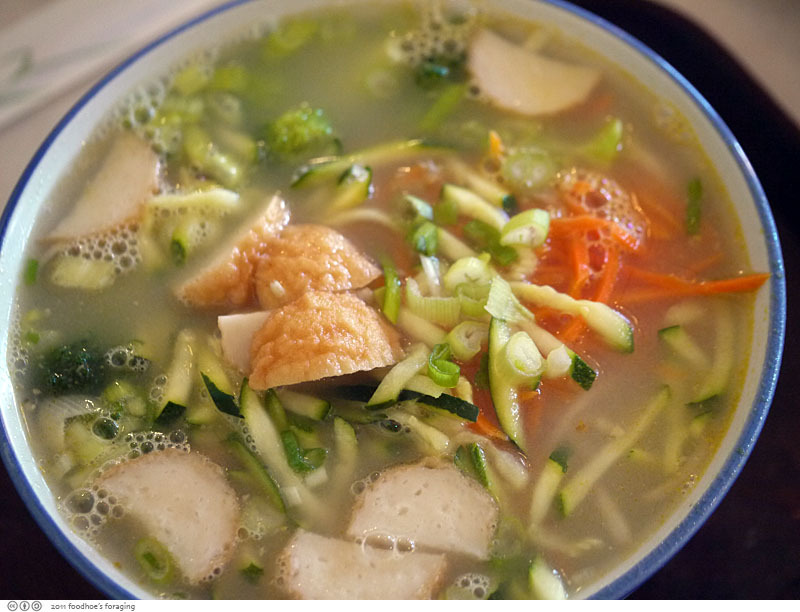 The Fishball Noodle Soup ($6.50) was filled with fresh julienned vegetables. The Soba Salad with fresh vegetables and grilled chicken ($9.95), is a cold dish that is refreshing on a hot day. It’s served on a plate like a salad, but probably should come in a bowl because it swims in a ponzu-esque dressing (soy sauce and vinegar). 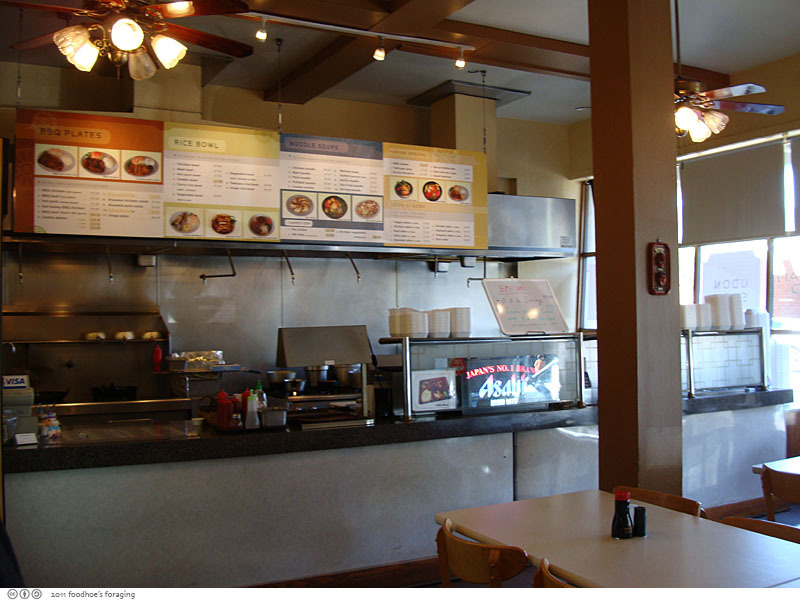 Urbanspoon needs to update their website, this used to be Sorabol, which is a Korean chain that sells teriyaki and bulgogi but doesn’t serve kimchi. Koreana Kitchen is way better than Sorabol and definitely has kimchi. It is an excellent place for a quick affordable meal and is one of the few places that has serve yourself hot tea! Sorry about the crashing and burning, Sandy! It’s happened to all of us 🙂 xo! thanks gastrogirl, it was very traumatic! 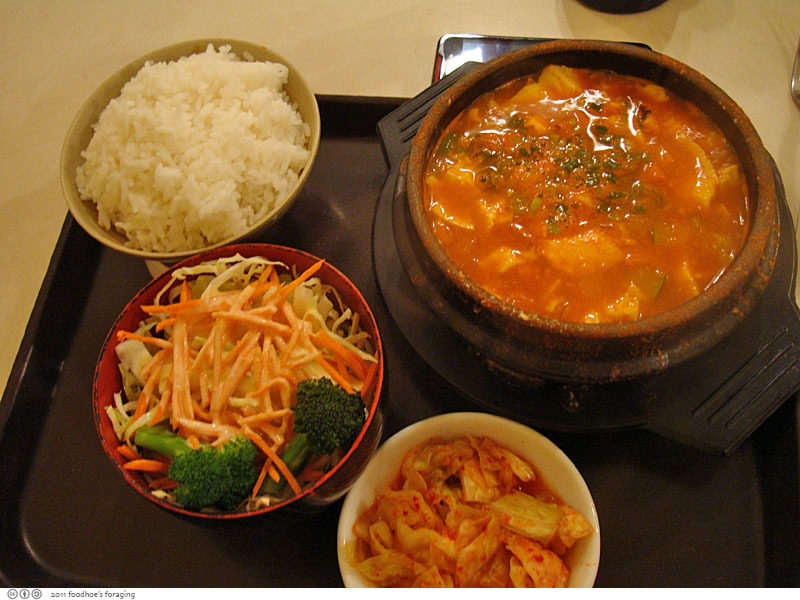 I’ve been dining at Koreana Kitchen for years, prior to the renaming of Koreana Kitchen. 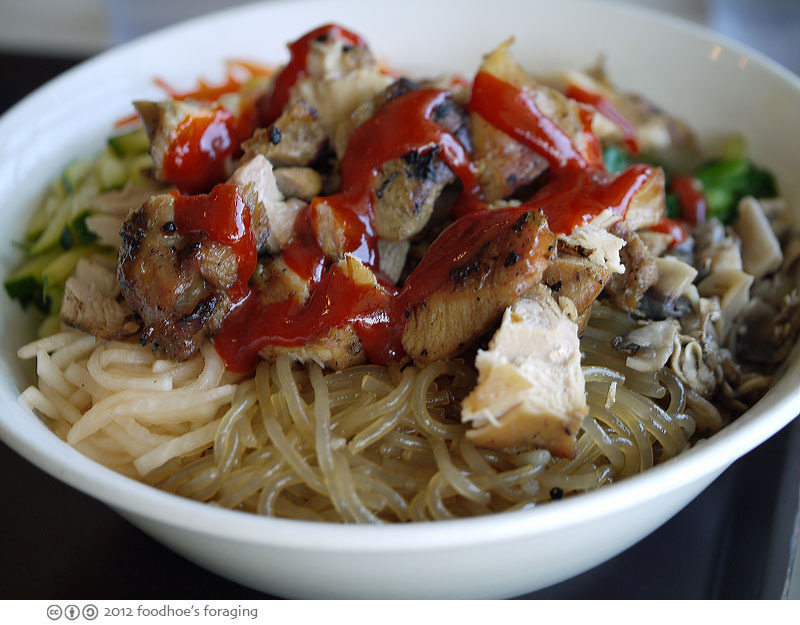 This restaurant went though a few ownerships in the past, but always continued the menu BBQ bowls, BBQ plates and noodles soups from the initial ownership as Sarabols. We stopped dining there for the last 10 years beecause our Korean taste has expanded to more than just Korean BBQs and noodle bowls. Because of your write up, I did not know that the latest ownership expanded their menu to their house special Korean dishes. We dine there this weekend and love it. I had the seafood tofu stew and my husband had the bibimbap. So affordable and so authentically tasty. I will be going there more often from now on. Thanks for your write up and nice photos. You don’t have to show this comment on your blog. in case you are planning to make the Lemon Ricotta Muffins from my site with meyer’s lemon, I tried the muffins with both meyers and supermarket (Eureka) lemons. I prefer using the supermarket lemons because the lemon flavor from supermarket’s lemon is far more robust. I hope you give this muffin a try. It’s so delicious! Hi again! Just want to let you and your readers know that Koreana Kitchen serves brown rice which is a big plus! It seems to be a weekly night at Korean Kitchen for us and I just had to ask whether the restaurant serves brown rice. I am so glad they do. You can even ask for their dinner bowls with brown rice. They don’t advertise that, but if you ask, they have it.